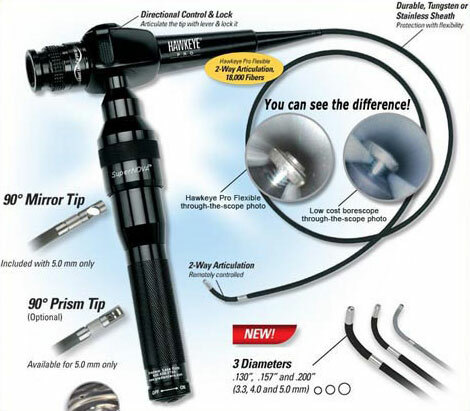 Priceless Aviation Hawkeye Pro Flexible fiberscopes incorporate an 18,000 fibre, acid-leached imaging bundle, delivering truly excellent image resolution, sharpness, detail, and contrast. Lower cost alternatives do not deliver image quality nearly this high. Pro Flexibles also offer 2-way articulation! Control the direction-of-view (DOV) of the tip over a 240° range (±120°), in a single plane, using a thumb lever on the aluminium borescope body. The lever can also be locked to hold a particular view. Due to newly advanced optical design and construction, Priceless Aviation Hawkeye Pro Flexibles are now available in diameters of 3.3, 4.0, and 5.0 mm. The 3.3 mm can look inside very small bores, and navigate tight bends. The 4.0 mm is perfect for specialised applications like aircraft and helicopter maintenance inspection. The whole line of Pro Flexibles are either tungsten or stainless sheathed and each scope comes complete with the powerful, rechargeable SuperNOVA Light. The Priceless Aviation Hawkeye Pro Flexible sets a new standard of excellence in quality and functionality, at a very reasonable price.